High torque fiber optic handpiece packaged in a mid-size head with 16 watts of power. Bundled fusion-optics provide greater light output and longer life. The Stylus Lite weighs only 61 grams (17 grams less than the original Stylus), and has a tapered rear sheath for better balance and hand grip. Unique air-flow design reduces noise level by 10 decibels. 4-port water spray for better cooling and visibility. 2-year warranty on handpieces; 5-year warranty on fiber-optics. 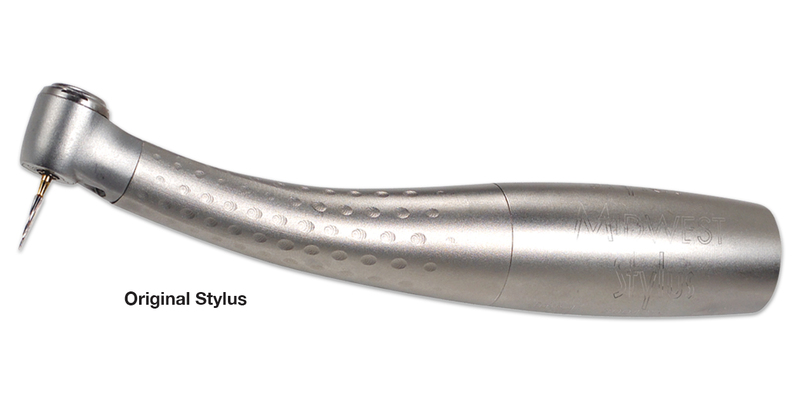 You are welcome to use the Midwest Stylus handpiece on a complete satisfaction guarantee basis; if you are not fully satisfied with this product, return it within 30 days for a complete refund. You may use one in your office on a trial basis; however, we can only accept the return of one unit in used condition.